Thai limes picked in a 16 oz glass jar, there are approximately 7 lime per jar. The label says "lemon" but this is an incorrect translation as they are indeed "manao" (lime). 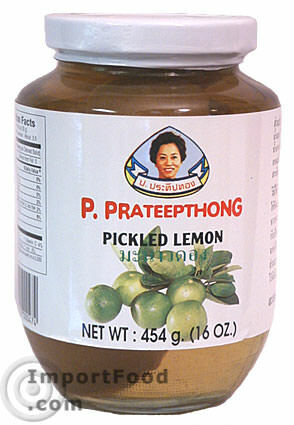 Pickled lime are used to add taste and aroma to a delicate Thai-Chinese style soup. The soup is mild, a contrast to the typical spicy-sour combination, and has a unique aroma. "Ped toon manaow dong" is a Thai classic served especially at celebrations. Ingredients: lime 51%, water 45%, salt 2.5%, citric acid 0.5%, sugar 0.95%, sodium benzoate 0.05%. Product of Thailand. Customer Testimonial: "This is GREAT STUFF. One of the simplest things I tried was dicing fresh tomatoes and adding some of the lime chopped to it. Nothing else. Heavenly result. Then I used some as a sort of relish (chopped also) on top of a tenderloin steak. Wonderful! They are a mouth-watering sweet 'n sour lime flavor. You can bet this is something I'll 'never' run out of." Pickled lime adds wonderful taste and aroma to this delicate Thai-Chinese style soup. The soup is mild, a contrast to the typical spicy-sour combination, and has a unique aroma. This Thai classic is served especially at celebrations. This recipe is made with either duck or chicken, it really doesn't matter. If using chicken, cornish game hen works great. Wax gourd is readily available in many supermarkets throughout the summer. If you decide to add the wax gourd to this recipe (it's optional but recommended) be sure to peel it, slice lengthwise and remove seeds, then cut into chunks about 1 inch in diameter.